BBC SPORT | Football | African | Do friendly matches really matter? Do friendly matches really matter? Four of the five African teams going to the World Cup finals were this week engaged in friendly matches in preparation for Germany 2006. Angola were beaten 2-0 by South Korea while the Ivory Coast suffered a 3-2 defeat in Spain. Ghana went down 1-0 to Mexico in the United States and Tunisia lost 1-0 at home to Serbia-Montenegro. There is no doubt that these four sides will view the matches they played on Wednesday as useful preparation for players who do not play regularly together. Those in favour of friendly matches say aside from serving as practice for important tournaments, they give coaches a chance to experiment with new players and new formations. But there are, of course, who question the worth of friendly matches and dismiss them as a waste of everybody's time, with "meaningless friendly" being their favourite catchphrase. Critics argue that as they are not competitive matches, friendlies do not really prove anything and often make their lack of interest clear by staying away from the ground. Do you agree that friendly matches are meaningless or are they of great value for national sides? And with Wednesday's friendlies being the last official set of international warm-up games before the World Cup finals, are the results indicative of what the Africans will do in Germany? Send us your view on this topic using the form on the right.Some of your comments will be published below. Friendly matches are not meaningless because it gives coaches the chance to assess the strength of their teams and see where they are lacking. However, a result in a friendly should not be the yard stick by which to measure a team's capability in competitive games. I don't see why this should be an issue for discussion. This is really a no-brainer. Anyone who doesn't see the value of friendly games may want to rethink their whole concept of the game. I disagree with the proponent of 'meaningless friendlies' which is only in the imagination of club bosses, as typified by Arsenal's Arsene Wenger. The clubs have these players for a reasonably long time and are solely concerned about the fatigue and injury risk to their players who go on international duty. I believe no matter how many friendlies Angola, Togo and Ghana play, they are wasting Africa's slots and will certainly be slaughtered in Germany. 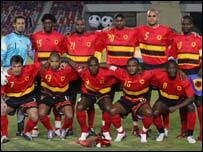 There will be no Senegal '02 or Cameroon '90 miracle but only large defeats and tremendous embarassment for Africa. Friendly matches are just ceremonial games that do not bring out the best of players. While the results from friendlies may not reflect a team's future performance, the matches would help in exposing the strengths and weaknesses in a team, as well as helping in team selection. I think African teams take pre World Cup friendlies more seriously than European teams. What we have seen from recent games may not be too far from what we shall see in Germany. African teams take the friendlies as if they are playing at the World Cup but when they get to the World Cup they play as if its a friendly game. Friendly matches, to a certain extent, only boost your standing in the Fifa rankings and increase a team's level of confidence. But I think using friendly matches as a form guide before a tournament will be misleading. Prior to the 1994 World Cup, Columbia was the team to beat after recording impressive wins against Argentina and Brazil but they were walloped 4-0 by Romania in their first group match. I have mixed views on friendlies, while they expose the strength and weakness of a team and help a coach to improve his side, a friendly is meaningless if the game is not well planned. In the case of the Ghana-Mexico game, the venue was at our disadvantage since USA will have the opportunity to study our style of play before we meet them at the World Cup. But I also think the defeat will make our opponents to underrate us and that will be to our advantage at the World Cup.